Democracy in action is a wonderful thing. Until it gets in the way of American foreign policy. No doubt there is a good deal of chortling and huzzahs in the bowels of the liberal establishment today. The Bush Administration’s attempt to strong arm the Turks into granting approval for basing US forces for the Northern Front of the Iraq War has come to naught. Hopefully, the administration has learned a lesson about the projection of power in the Middle East. While bargaining and bachsheesh are the norm for such transactions the auction for Turkish permission insulted the Turkish government and exposed how desperate the US can act in public. It brings no honor to the Turks nor to our own nation. Turkey has been an invaluable and reliable ally of the US for over 50 years. Turkish soldiers fought bravely at our side in the snow covered hills of Korea. The Turkish Brigade is credited with saving the hide of a US infantry regiment that was nearly destroyed in those barren hills. The Turks have more than proved their commitment to NATO and the US. Regardless of whether their decision was motivated by domestic politics or just an insistence on national pride, we should take the Turkish decision as a given and move along to the next point on the timeline. It depends. The most valuable contribution Turkey can make is the air bases. This was never in doubt. US and allied forces are already stationed in Turkey enforcing the northern no fly zone and Turkey did permit us to use these bases for the 1991 Gulf War. Strategically, the ability to attack Iraq from multiple aerial compass points is far more important than basing of ground forces. As I noted many months ago, the terrain along the Turkish-Iraq border is mountainous (a natural boundary) and limits the movement of mechanized forces into northern Iraq. I would not expect the Iraqis to seriously contest these mountain passes, but they are substantial choke points that would open US forces to attack from chemical weapons delivered by rocket. My theoretical northern attack force called for one mechanized division (a heavy division in Army speak) married with one airborne or air assault brigade to seize key terrain south of the border. Under the current situation we could modify the plan and place greater reliance on our airlift capability. Dropping an airborne brigade into northern Iraq to seize an airfield north of Mosul and back filling with mechanized infantry battalions brought in on C17s and C5As. It is even possible that the troops and equipment could be airlifted into Turkish airfields for staging and configured for tactical operations. While the Turks clearly oppose the transit of tens of thousands of American troops from the coast to the far eastern provinces, the Turkish Army would likely turn a blind eye to the use of Turkish air bases as staging points for an operational level air assault. There’s more than one way to skin this bird. If you thought that US ground troops attacking from Turkey was the only plan, you’ve a lot to learn about how war plans are created. From the off the wall department, let me submit one idea I have not read elsewhere. Is it possible for the 4th Infantry or the 101st Airborne to be offloaded in Jordan and quietly dispatched to the remote frontier? As I’m writing this the word is that troops of the 101st are finally deploying from Fort Campbell. Destination: Centcom. No other specifics. From what I’ve seen locally the troops from Fort Hood (4th ID) are still sitting in Killeen waiting on final orders for their port of debarkation. All things being equal a lot depends on the movement orders for the 4th ID. If they deploy in the next few days then that means a decision has been made about where to debark the equipment. Either rolling the dice for another try at Turkey or perhaps an alternative. If the decision is to go to Kuwait then the ships will take at least a week, maybe longer to transit the Suez and get into the Gulf. Jordan is not as far fetched as you might think. It provides many of the same advantages as Turkey (except for distance which is longer) and it provides an avenue of advance from the west with the potential to link up with the Kuwait forces advancing from the south. The challenge of attacking from Jordan is that to my knowledge we do not have sufficient logistical infrastructure in place to support a division sized attack. I’ve been doing some revising of the phases that the war will likely follow. While the current headlines scream out for a rapid and overwhelming death blow on day one, combined with a furious ground assault I think there is less here than meets the eye. In particular while our combination of air assets is impressive I think they are insufficient for the type of massive attack anticipated. There are just too many targets that must be destroyed our suppressed. The no brainer part. Standard doctrinal attacks to dislocate the enemy control of forces and air defense assets. One wave will not be sufficient to guarantee total destruction, this will likely last for two or even three days. The greatest risk to allied forces is the employment of chemical weapons. I think this is one reason why we have not provided all this data to Hans Blix and the inspectors. Tommy Franks will want a nearly ironclad assurance from the air commander that all known and many suspected sights have been suppressed or destroyed. This will require cooperation with Special Forces units for targeting and interdiction. The actual targets will not be the weapons, but the guard forces and special weapons handling units, as well as motor transport and rail facilities that could be used for deployment. Saddam faces an interesting choice regarding his chemical weapons. Military prudence argues for moving them out of dumps and into the hands of artillery and missile troops. They can only be used if they are in the field. But this will expose them to detection from aerial and electronic surveillance. And since much of his presumed power depends on their possession, he is not likely to let them slip away from his trusted guard units. The risk of chemical attack will drive another facet of the allied war plan. The best defense against chemical weapons is movement. For that reason I expect a rapid relocation of allied forces on the first day of the attack. Ground units will move out from Kuwait and into Iraq as soon as the air strikes go in. They will attempt to hide in plain sight. Iraq is very large as we know and disappearing into the vastness of southern Iraq will confound Iraqi efforts to target our attack forces. This will also enable the right flank forces of the attack (probably composed of the British and the USMC) to isolate and prepare to seize Basra as well as securing bridges over the Tigris River. The left flank forces, V Corps, will advance to the northwest toward the marshes along the Euphrates River. This will be the first jump. And the logistics base will be displaced at the same time. Rather than permanently locating in northern Kuwait, and being exposed to Iraqi missiles they log base will disappear as well. I anticipate that it will be moved in close proximity to the Tigris River and once Basra is secured the river will become a major supply route directly from the Gulf. I’m not certain of how navigable the river is but there should be sufficient numbers of logistics boats to open this line up in the first week of the war. The center of gravity in the war is the Republican Guards. Without their military clout, Hussein is doomed. For this reason phase II of the offensive will focus most of our air assets on taking the Republican Guard out piece by piece. This will be the longest part of the air campaign. I’m not saying that US ground forces will receive no air support, only that fighting this deep battle is more critical than providing close air to the ground attack. US divisions have a substantial force of attack helicopters to provide aerial gunfire support for tactical operations. And US forces in a one for one fight are far superior to the average Iraqi regiment. 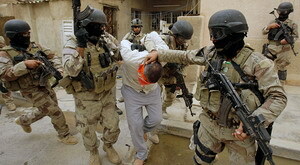 As US forces advance toward Baghdad regular Iraqi forces will be either engaged and bypassed, converted (ie surrendered) or masked by follow on forces. The best, though imperfect, analogy I can make is the German advance into France in 1940 or the advance of the 3d Army across the same terrain in 1944. Divisions will leave their flanks guarded by light forces of air cavalry or similar units and each advance will be backstopped by a follow on force to deal with recalcitrant Iraqi army units. Speed in this case will both limit casualties and serve to dislocate any Iraqi counter strokes. Ultimately the goal is to arrive in the vicinity of Baghdad quickly to take advantage of the damage and confusion created by the air campaign. Never allow the enemy forces to catch their breath. For our purposes the most important pieces of real estate are the bridges. I expect the capture and defense of those features has drawn the special attention of Centcom. While we have good bridging capacity, the use of permanent fixed bridges is critical to maintaining offensive momentum. We may rely on a combination of aerial insertions (by SF, Rangers or other specialized units) and even local guerilla troops led by SF teams. These are high risk missions, they will be a critical focus. While the oil fields are important, I don’t think we have sufficient forces in place to seize and defend them. They are too widely dispersed and to both seize and hold them detracts from the prime mission of getting to Baghdad. It is one of those risks of war that we will have to accept. Saddam might be able to dynamite some or even most of his oil wells, but as our experience in Kuwait demonstrated this is a problem that can be solved in less than a year. We just don’t have the luxury of having too many objectives, we have a paucity of forces. Priorities must be set and rigidly enforced. Advance into Iraq, seize Basra and the Ramallah oil fields (southern Iraq, south of the Euphrates). Relocate log bases into Iraq. Advance to seize An Nasilyah on the bank of the Euphrates. Advance up the Euphrates Valley (V Corps) to vic Karbala. Advance along Tigris River as flank protection (USMC and British 1st Armored) Al Kut. Air assault (101st Airborne) to secure Ar Ramaldi (west of Baghdad). Receive and deploy 4th Infantry Division. 4th Infantry advances from Al Kut to north and west to secure west bank of Tigris River east of Baghdad. V Corps advances north to link up with 101st Airborne. 4th Infantry extends north to secure Sammara along the Tigris north of Baghdad. V Corps links up with 4th Infantry south of Baghdad. XVIII Corps (Airborne) with elements of the 101st and 82d seize Bayji (north of Tikrit). V Corps and 4th Infantry complete encirclement of Baghdad.